Dunitz & Company: Handmade Fused Glass Jewelry - & Ours is Fair Trade too. 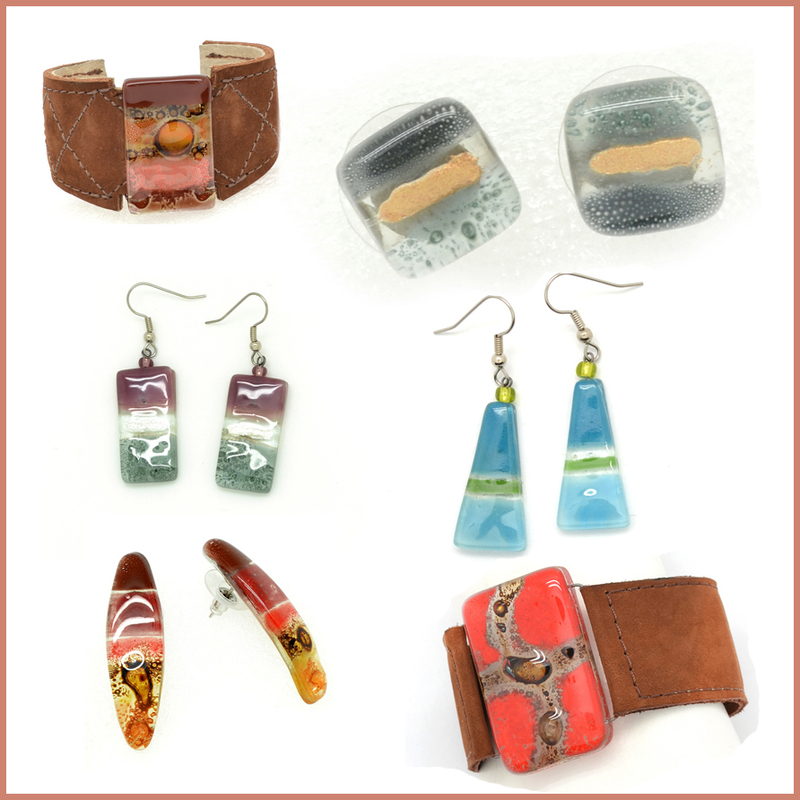 Handmade Fused Glass Jewelry - & Ours is Fair Trade too. After completing a trade show, I always realize how much confusion consumers have about art glass and glass jewelry. People love Dunitz & Company's fair trade fused glass jewelry. But they don't always understand exactly how it is made. Our Joanie M jewelry is "fused glass". We found this definition of the process on an ebay post. "Fused glass is a special kind of glass that must be fired in a kiln at certain temperatures to join separate pieces together. When glass is exposed to extremely high temperatures, it tends to melt, then solidify once it has cooled down." The photo to the right shows our little ring dishes (SKU: JM-D1) in process. The first square shows a painted piece of glass. The next shows it after it has been fired in a kiln. Our dishes are fired twice. In the middle of the photo you can see a mold where we shape the glass in a second firing. When you see fused glass you will clearly see a front (right side) and a back side that is flatter and not as shiny. Our glass is not made of recycled window glass. Our jewelry is very consistent in size, color and width. To achieve consistency, we must control the components we use. Often people come to our booth and start describing our jewelry to their companions. Sometimes I over hear them telling their colleagues that ours is 'dichroic glass'. It is not. Here is a definition of dichroic glass I found online. "Dichroic means two colors. When this glass is viewed from different angles, it appears as numerous colors. It has thin layers of chromium, silicon, titanium, aluminum and zirconium depending on the color. The color isn’t in the glass, but in a coating that is put on the glass in a vacuum chamber at high temperatures. The effect of this coating resembles an oil slick on water." The other common description I hear about our jewelry is that is is "blown glass". It is not. Here quick definition of glassblowing I found online. "Glassblowing is a glassforming technique that involves inflating molten glass into a bubble (or parison), with the aid of a blowpipe (or blow tube). A person who blows glass is called a glassblower, glassmith, or gaffer." Works made from glassblowing tend to be round and not flat.